This is a regular blog post. You can find show mores and links to show audio in the other posts. I’m back in the Civil Air Patrol Cessna 182T Nav III completing the transition training. 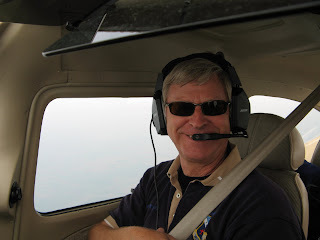 I went up with Capt Tim Kramer for 2.8 hours and flew from Oakland County International (KPTK) to Lansing (KLAN) (ILS 28L), then to Saginaw (KMBS) (RNAV 23 from MOGRE), then to Flint (KFNT) (VOR 18) before returning to KPTK (LOC B/C 27L). We got a good 0.9 in actual IMC with about half of that in genuine inside-the-eggshell conditions and a little rain on the windshield. Maybe 20 minutes was in my favorite conditions, namely poking in and out of the tops just above an overcast layer. A little ragged down below and not as well-defined as I like up top, but really cool nevertheless. And we benefitted from that inasmuch as there wasn’t a lot of convection to beat us up. The next flight will be the instrument failure and partial-panel stuff. The interesting thing is that, given the backup systems on the airplane, the worst failure of the core avionics still leaves me with as much, if not more, instrumentation than I’d have in a regular round-gage C-172. Yeah, the instruments are in different places (you have to look down at the center of the dash to see the backup attitude indicator, altimeter, and airspeed indicator) and your scan is a little different, but it’s still reasonably intuitive. At the end of the next flight or during one additional flight, I need to get up and knock out any of the required 25 landings that I haven’t done yet (and I need that – I’ve been having issues with my sight picture for the flare and flaring a little high) and do the stalls, steep turns, engine-outs, and other airwork that I’ve not done yet in the airplane. 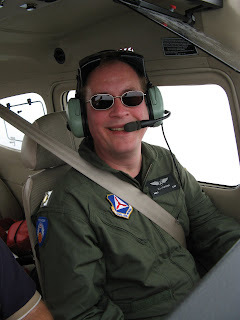 At that point, Tim gets out of the airplane and Maj Alex Craig gets in to administer my Form 5 ride, which will, if I pass it, qualify me to fly the C-182T for CAP as a mission transport pilot and to fly the airplane for currency. This is such a wonderful and capable aircraft! And, as a CAP pilot, I fly it for $36/hour dry and instruction is free. You’re going to get tired of me harping about this but, if you’re a pilot or other aviation enthusiast and you’re not a CAP member, what are you waiting for? I guess I’ll keep on harping until the ranks of CAP roughly equal those of certificated pilots in the US. The next flight is scheduled for Wednesday and then I’m off to Indianapolis for the Indy Air Show! Can’t wait!